Odin is the High One, the Father of our gods, the creator of our race. In the threefold aspect of Odin-Honir-Loður he breathed the spirit of thought and magic and awareness into us and made us human, the upright animal, with a spark of high divinity that makes us question and create and reach for the stars. Through him we gain strength, not merely the strength of muscle-power but moral strength, conviction. The strength to press forward against great odds. When our people had need for a god of war they cried to Odin, the giver of magical strength that is invulnerable, beserk wrath that can stride unscathed through the thick of battle, unarmoured and unshielded, and overcome a host of enemies. Not only strength but wisdom Odin gives us. The wisdom of all past ages. If we will come to him he will lead our living spirits to drink with him at the Well of Memory, Mimir’s Well, deep enough to hold the lore of all things past, all things that are now and all things yet to be. By sacrifice he gained the right to drink at this deep well not only for himself but for his people. Odin is the master of the magical art of poetry, that art which can touch the intuitive part of us by the use of words. The magic of poetry is high magic using words, the expression of the magical mind, and changing them into vehicles to carry the mystical knowledge from within us. The art of poetry is a gift to us from the All Father. 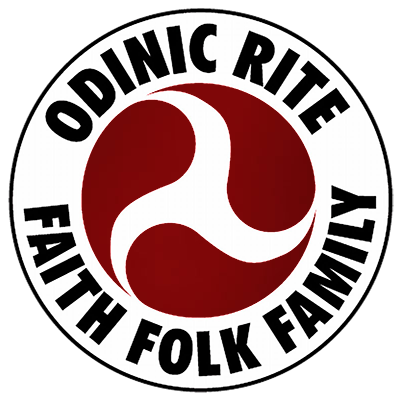 Odin is close to the world of Midgarth. Here his people live and strive and suffer. Here the battles great and small of Ragnarok are fought and he walks the Earth to rally his forces. Many thousands of years ago our people saw Odin as the god who rides the wind and moves across the surface of the surging sea. We can still hear his voice in the storm-wind if we listen for it. Even now it is possible in the forests of England to hear the Wild Hunt ride by. And no man knows where the roots of it run. Through suffering and sacrifice he gained this knowledge, not for himself only but for us, his people. He holds the threads of the Web of Wyrd that are our history. The divine trust of thought. And the wisdom to recognise them. To fulfil the great destiny of our people. And build the new Golden Age that comes after.